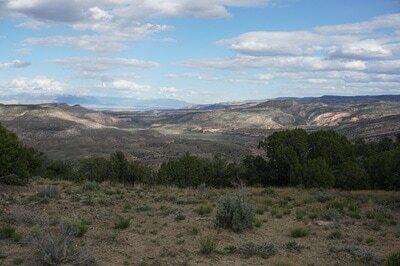 Directions: From I-70 take Exit 2 for Rabbit Valley. 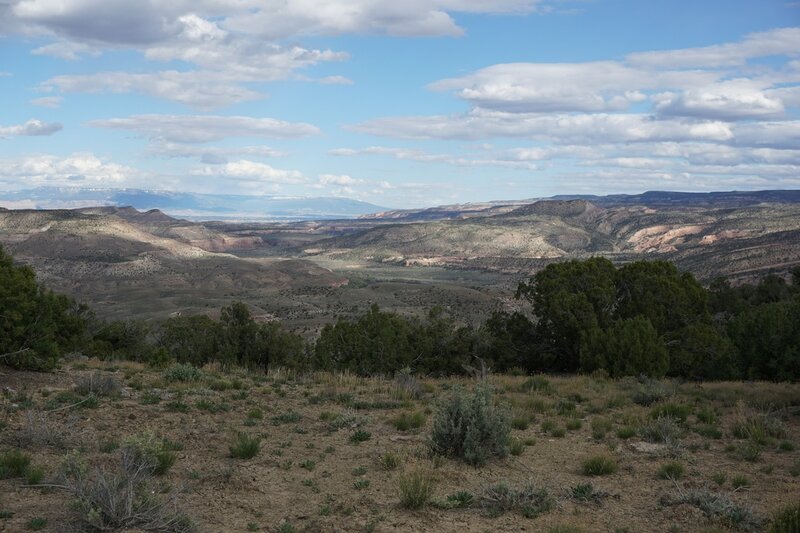 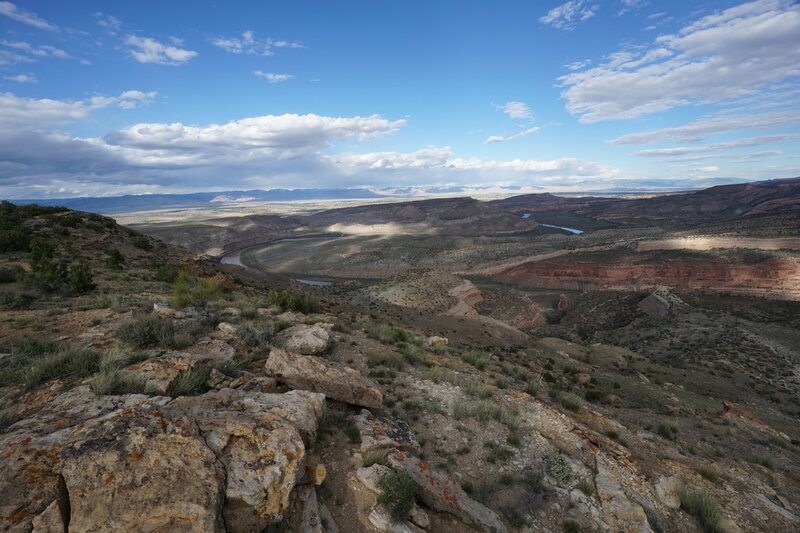 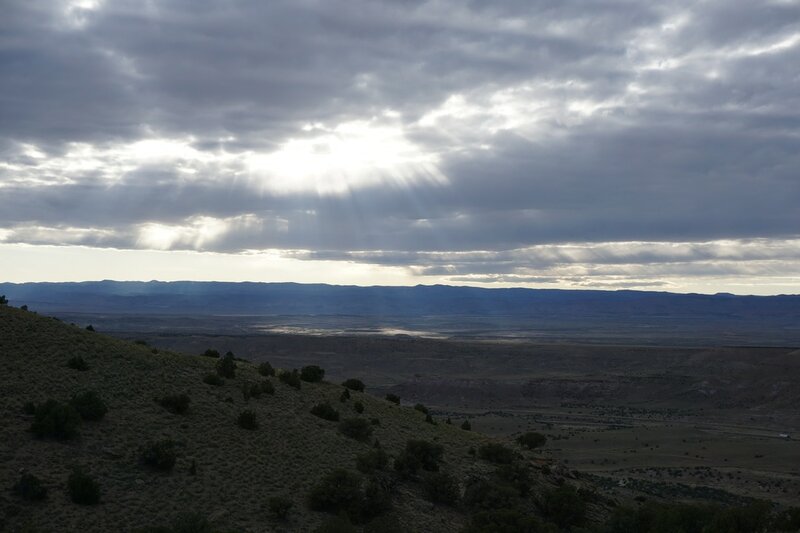 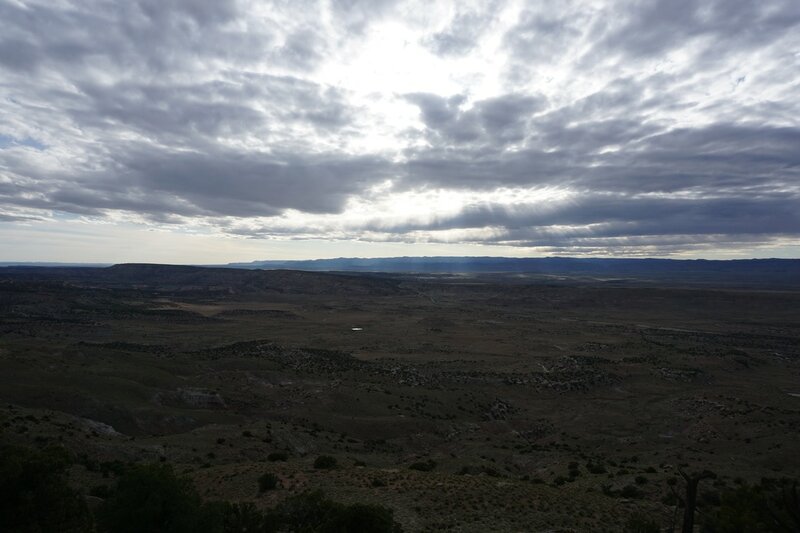 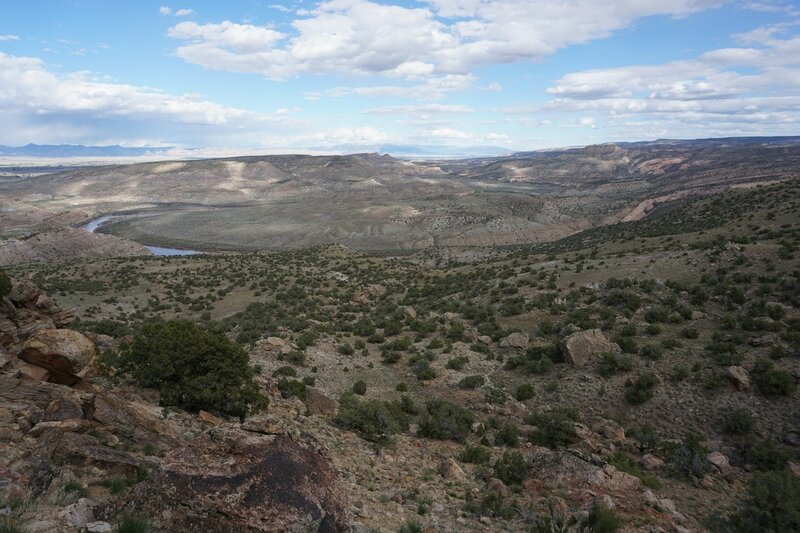 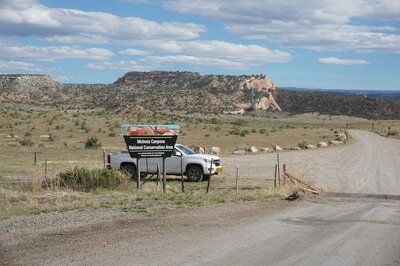 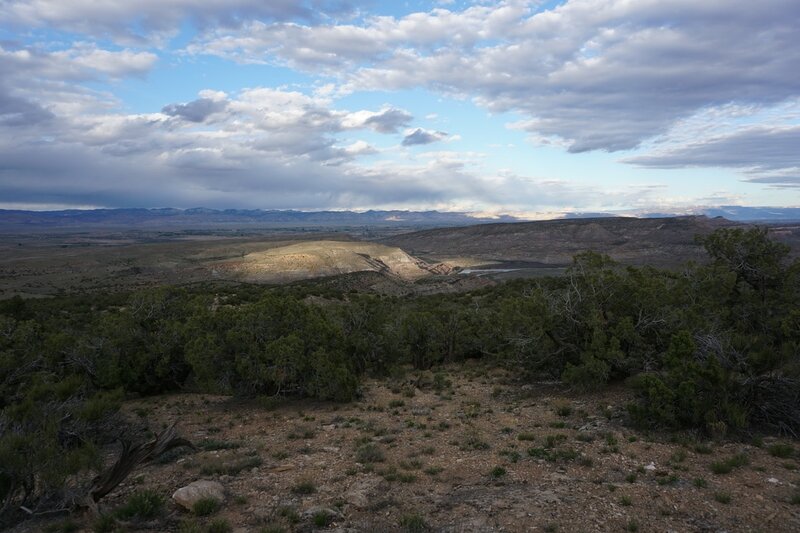 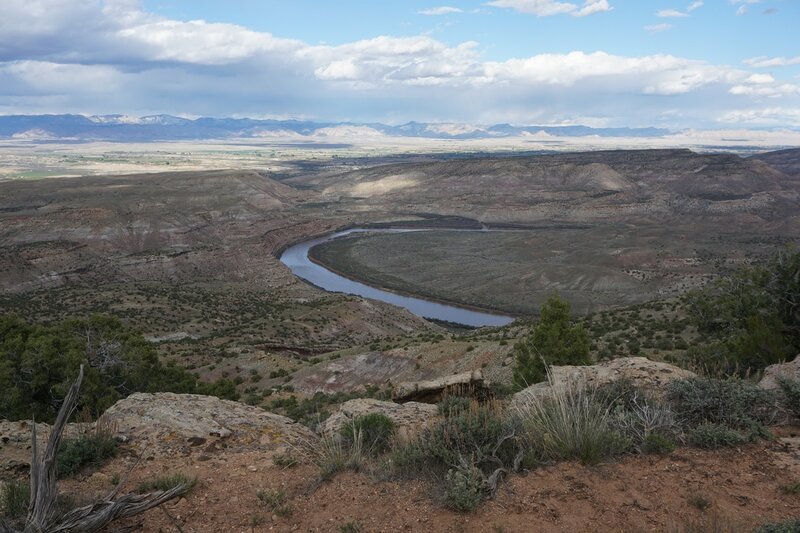 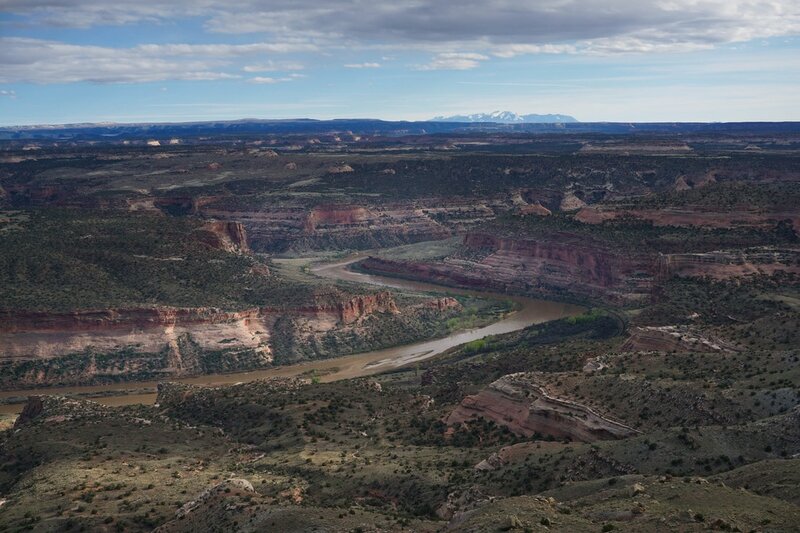 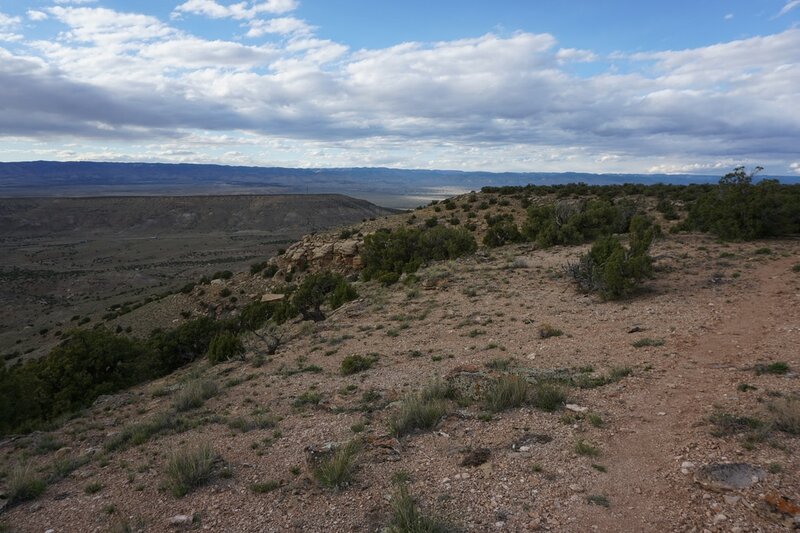 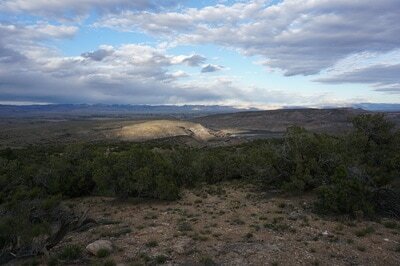 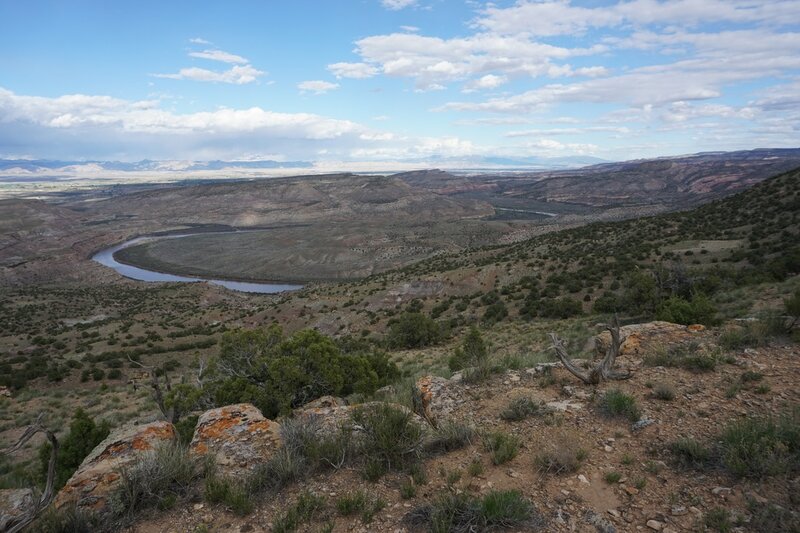 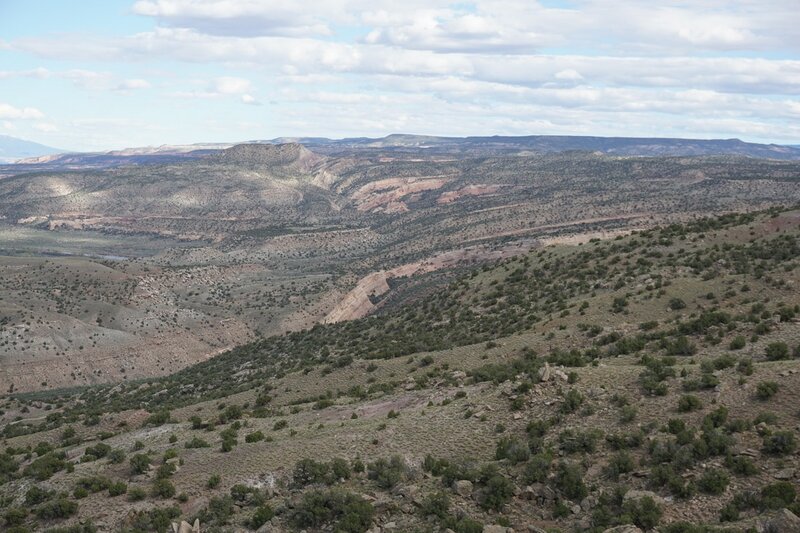 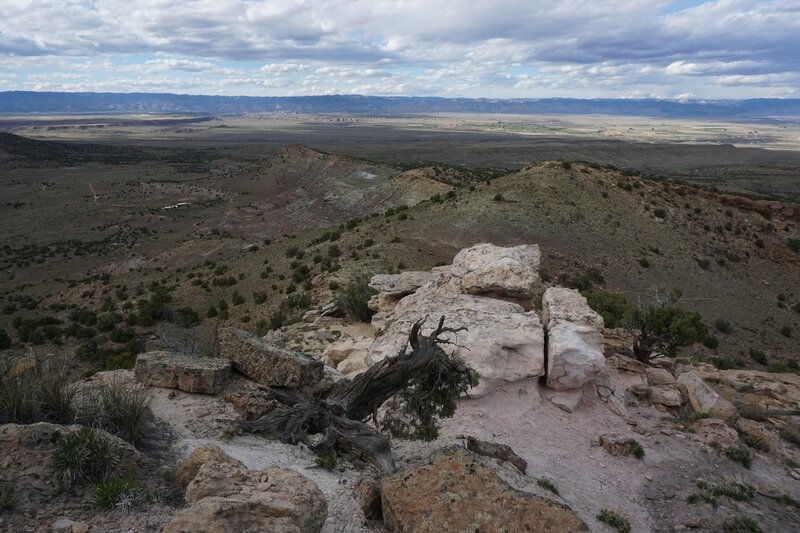 Head South on Rabbit Valley Road and enter the McInnis Canyons National Conservation Area. 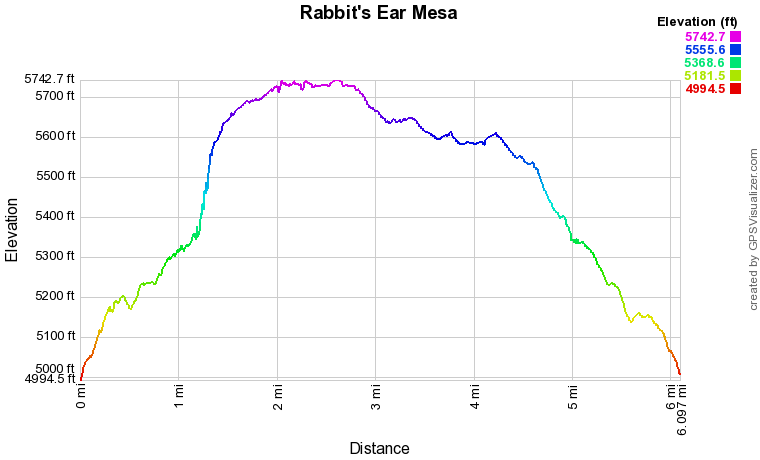 Follow the signs for the Rabbit's Ear Trail by turning left (east) on a narrow but good dirt/gravel road. 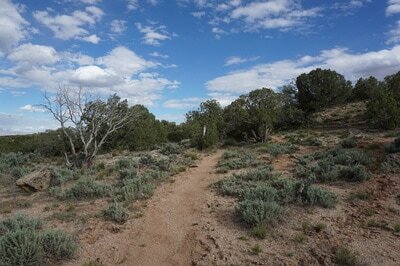 Follow the road for about 4.5 miles to the Rabbit's Ear Trailhead. The Rabbit's Ear Trail is one of the finest trails in the McInnis Canyons NCA, mostly because of the amazing view of the Colorado River as it winds through Ruby Canyon. The view is tremendous but the journey is also a pleasure. 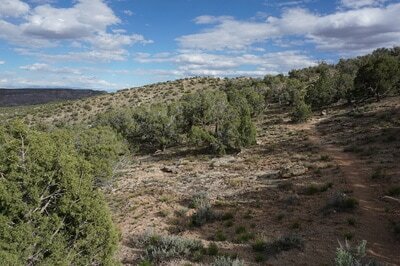 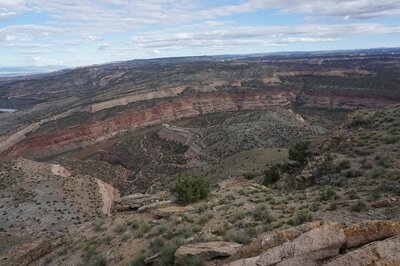 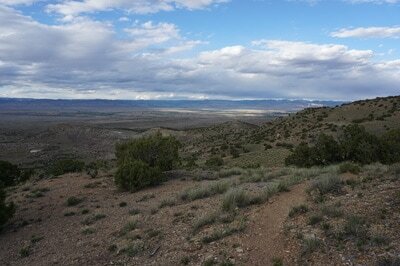 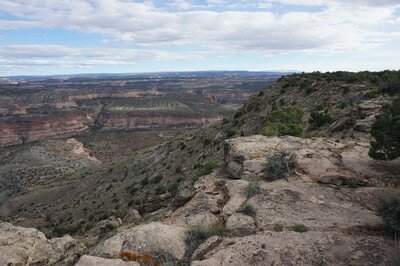 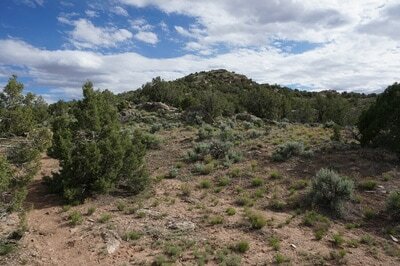 The trail climbs a ridge up to Rabbit's Ear Mesa and follows the rim for a 6 mile lollipop loop. 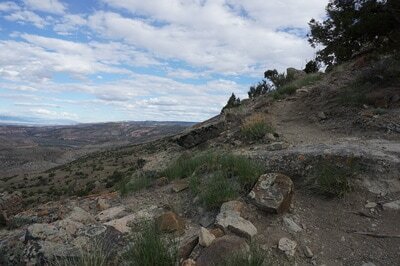 Note: Don't be confused by the map at the trailhead. The map says that the loop is 4.2 miles and the trail to the loop is 1.4 miles each way...not true. 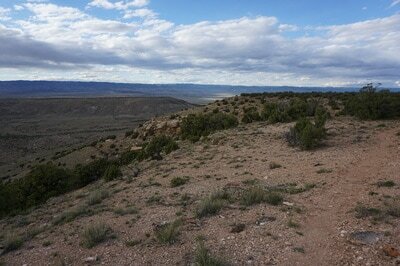 The loop is only 3.6 miles and the trail to it is 1.2 miles each way. 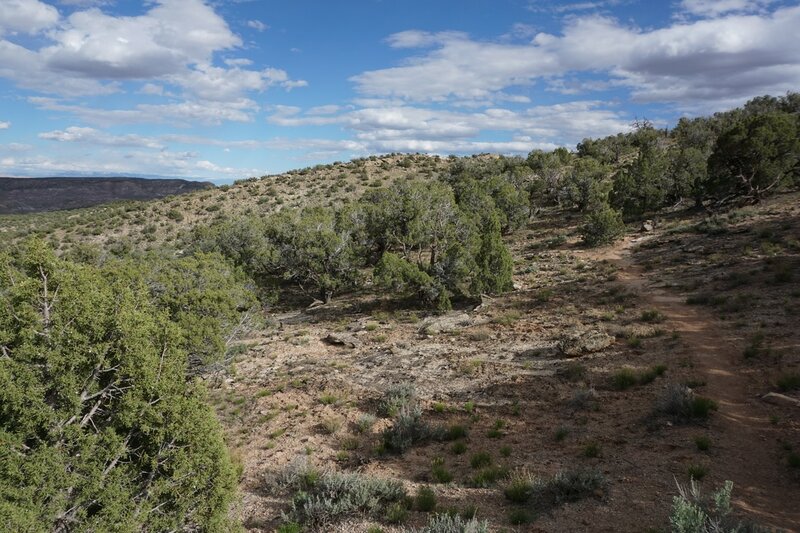 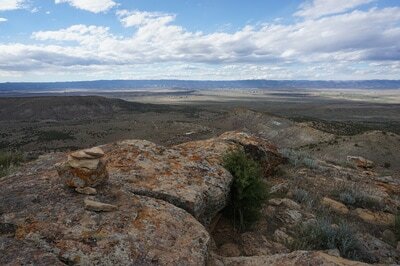 Almost the entire trail rolls through desert oak scrub with near constant views down to the grand valley to the east and Utah to the west. 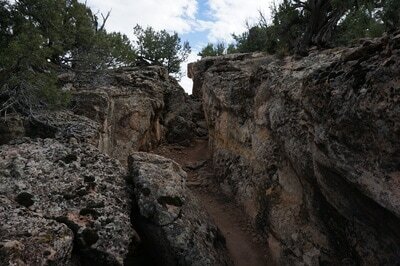 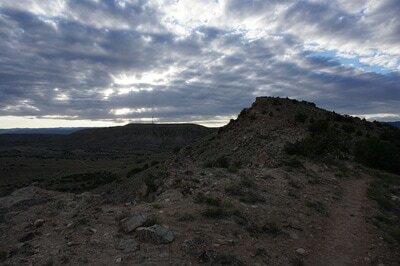 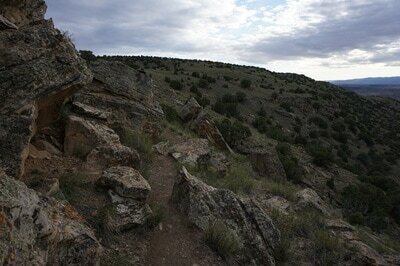 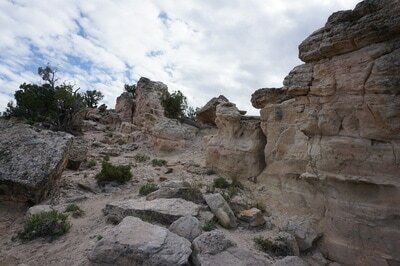 The trail is easy to follow with the steepest portion being the climb up the ridge to the mesa. 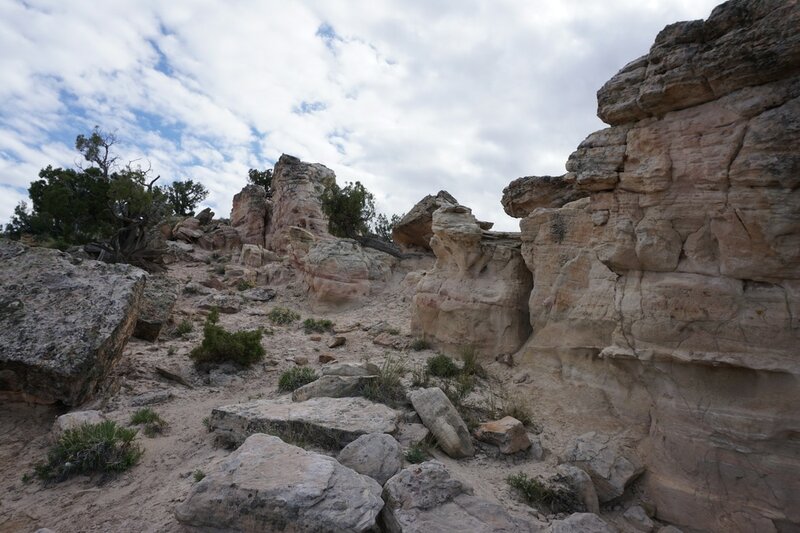 You'll know you are at the start of the loop when you see a large cairn and the trail branches off heading up a steep ridge that looks like a desert summit. 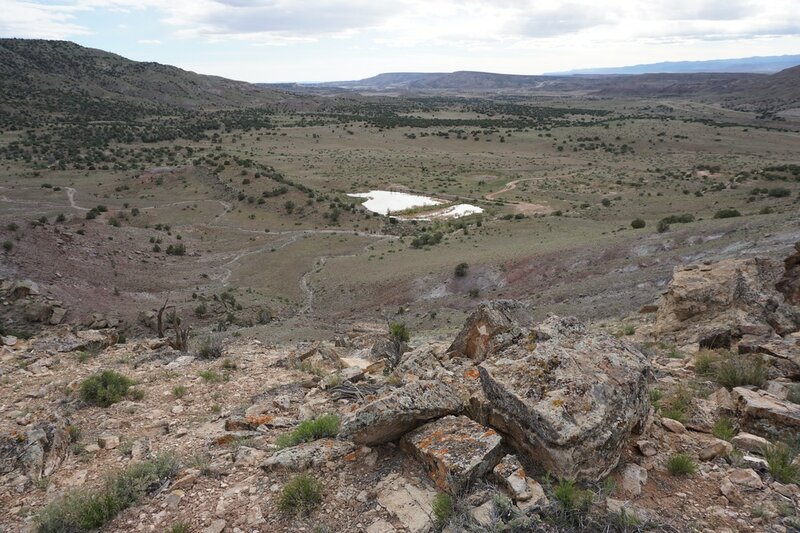 This point marks the start of the mesa section. 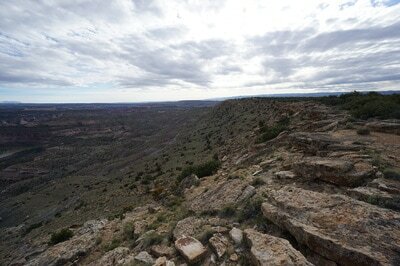 Once on the mesa, the travelling is easy with minimal elevation gain. 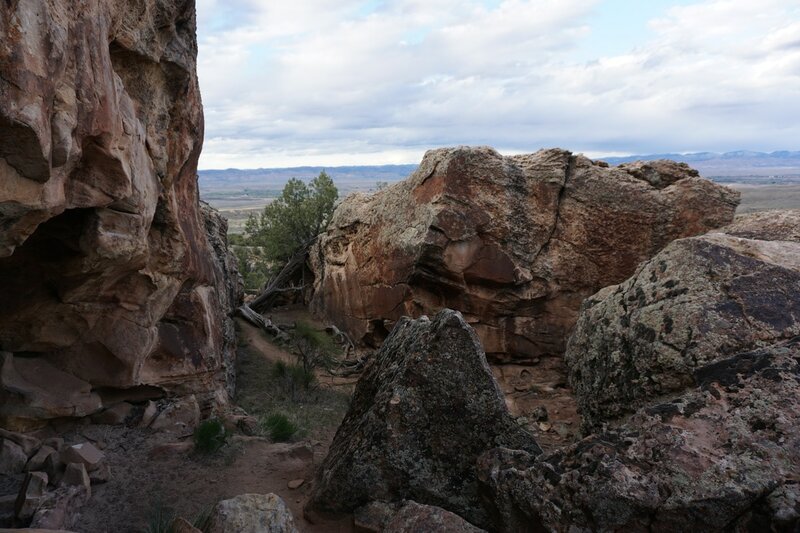 Along the way you'll pass through rock formations and get treated to various viewpoints. 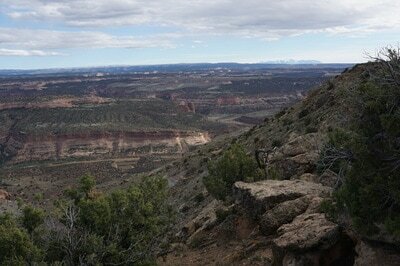 The main viewpoint is about 2.3 miles in and you'll know when you arrive. 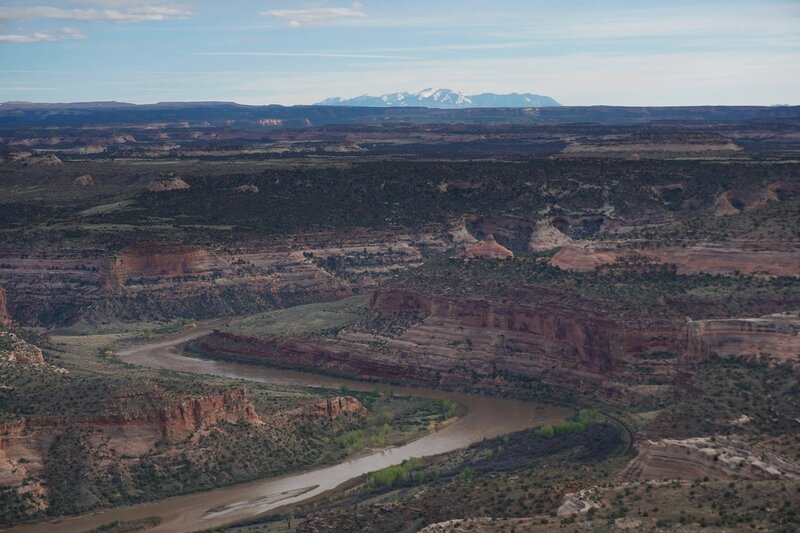 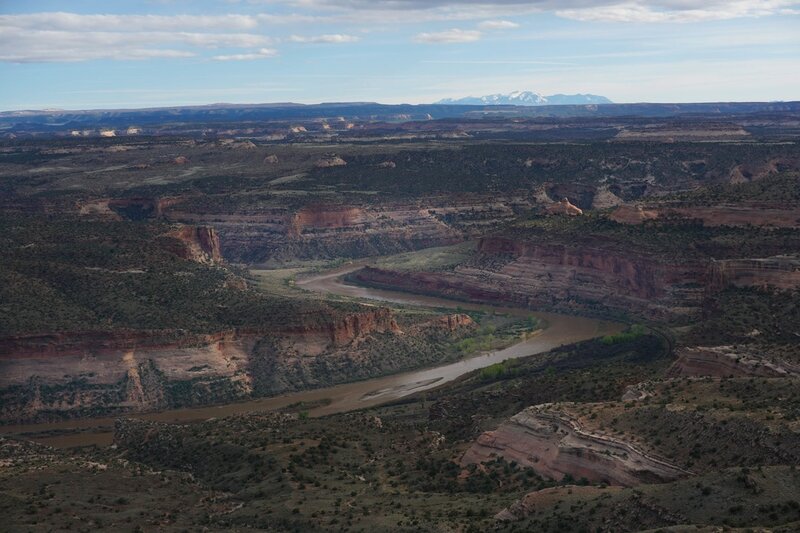 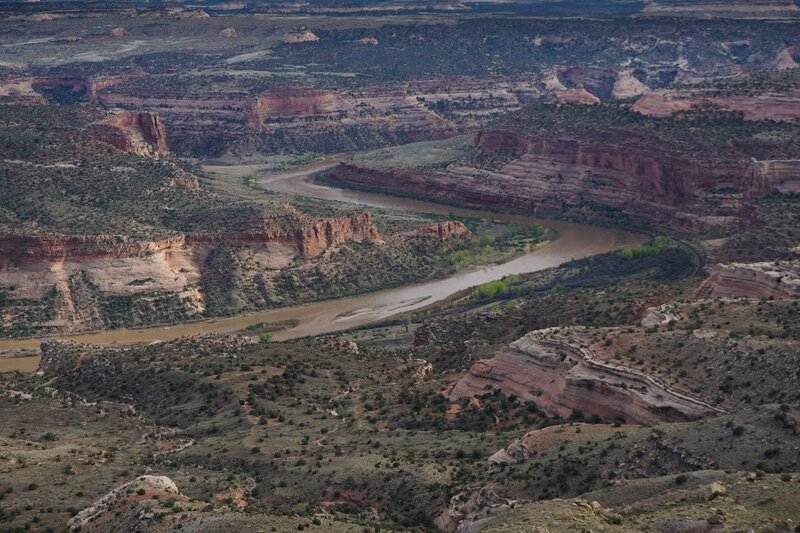 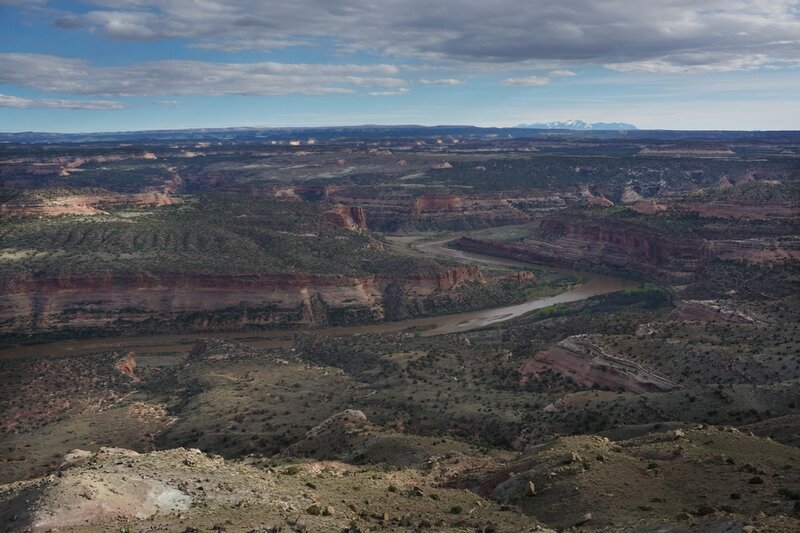 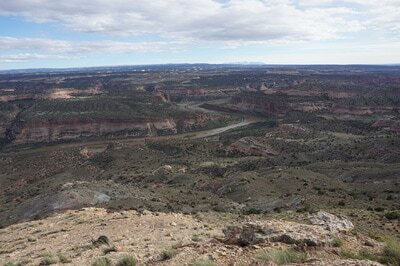 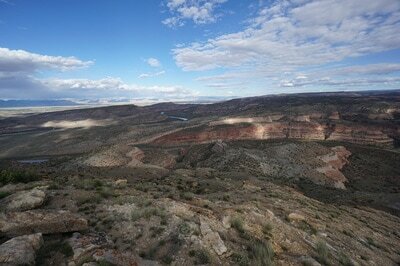 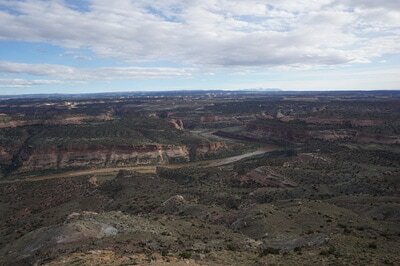 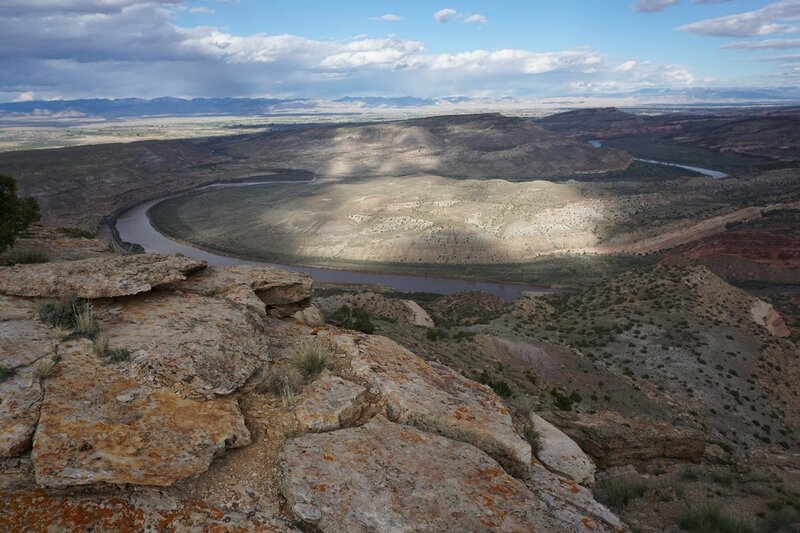 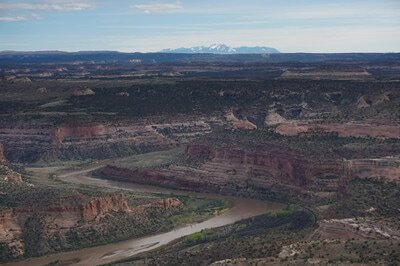 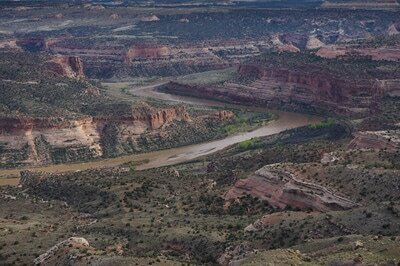 The viewpoint looks down on the Colorado River with the McInnis Canyons NCA to the south. 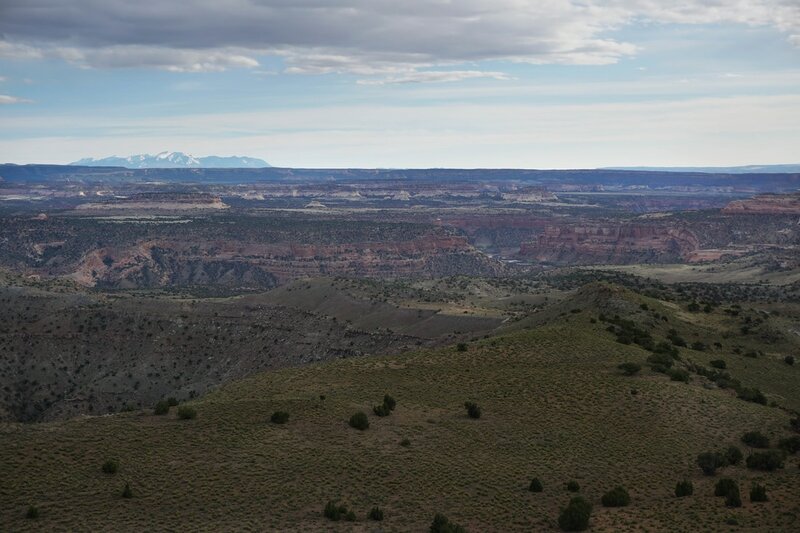 The intricate network of canyons is mind boggling and the La Sal Mountains rising in the distance will take your breath away. 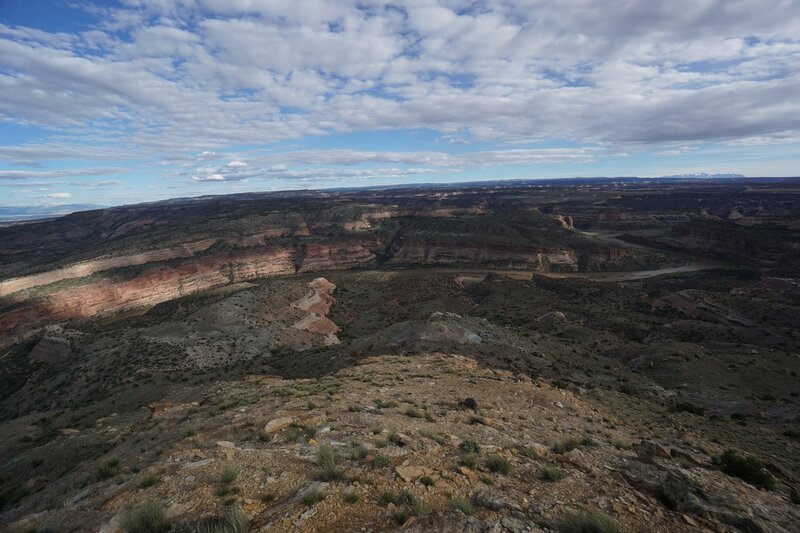 This amazing vantage point lasts for the next mile until you turn away from the canyons and follow the northern rim of the Mesa. 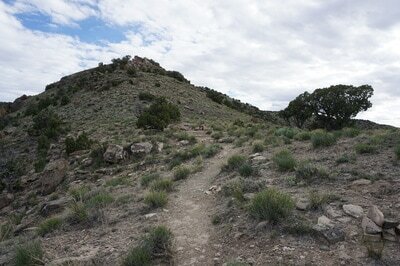 The trail dips and jogs for the next portion until you arrive at the fork and the end of the loop. 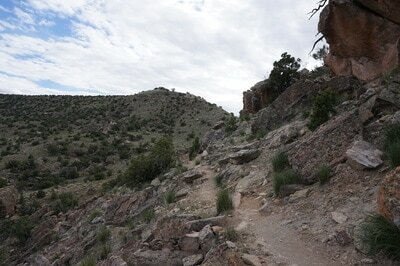 Retrace your steps back down the ridge to get back to the trailhead. 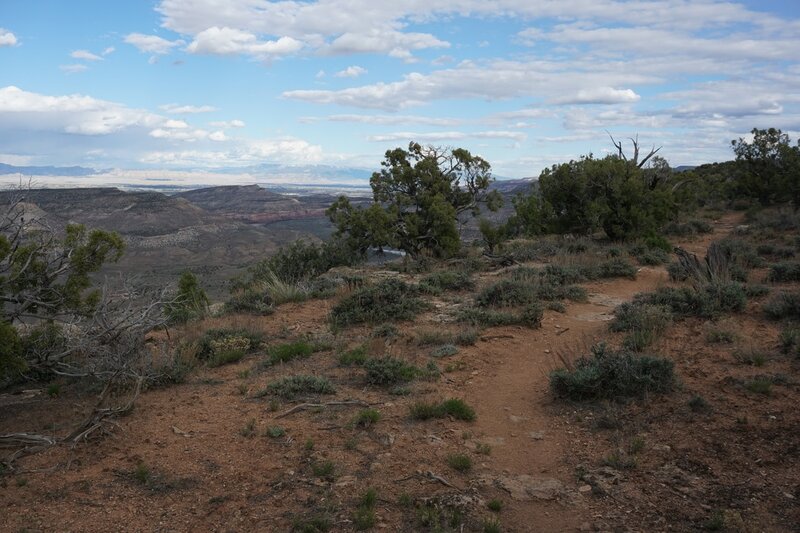 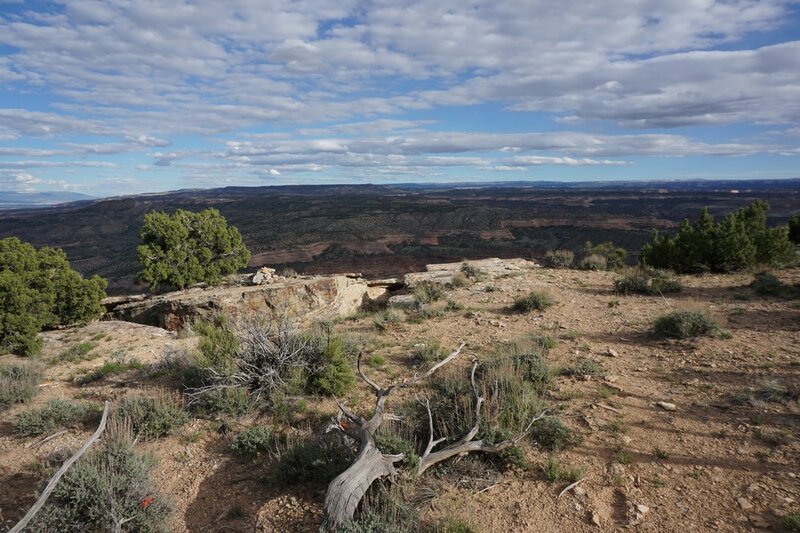 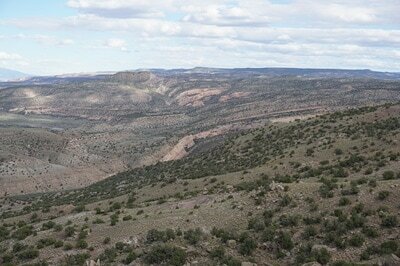 This trail makes the perfect introduction to the McInnis Canyons area with the birds eye view of the canyons below. 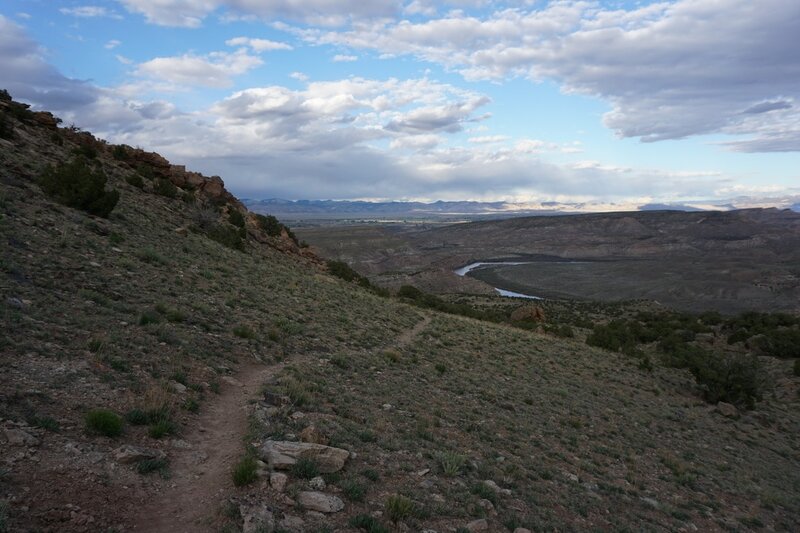 The trail is also one of the few hiker only trails in the Rabbit Valley Area. On a hot day this 6 miles will seem a lot longer so hit the trail in the spring, fall, or in the early morning and late afternoon. 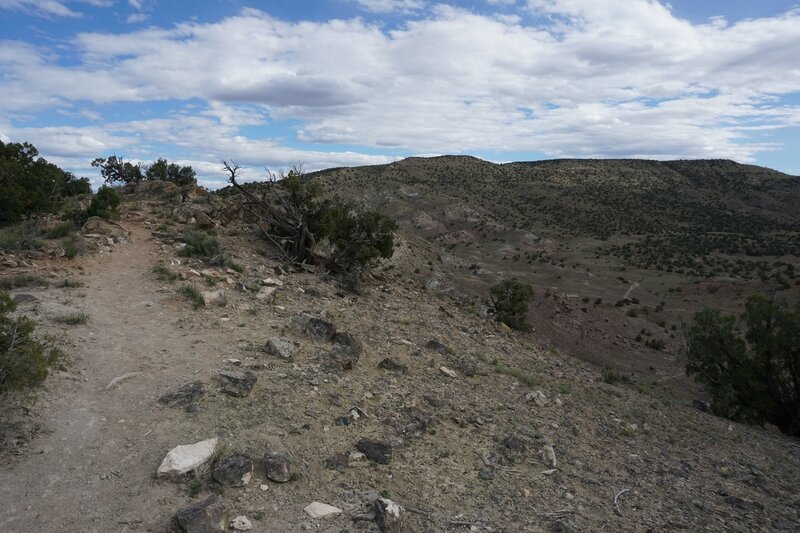 Either way the trail is worth the 6 miles of effort.